On October 16, the U.K. Parliament will hear testimony from a peculiar witness. The appointment, first spotted by the U.K. publication TES, will occur during an inquiry on the “fourth industrial revolution,” a loose term technologists use to refer to technology that blends physical, biological, and digital components. Pepper is the last witness after a selection of academics, roboticists, and computer scientists. According to the BBC, this will be the first time a robot has appeared before British lawmakers. But Robert Halfon, the chair of the committee that will hear from Pepper, struggled to explain the point of the robot testimony. “This is not about someone bringing an electronic toy robot and doing a demonstration, it’s about showing the potential of robotics and artificial intelligence and the impact it has on skills,” he told TES. We’ve written previously about Pepper, a line of robots created by Japan’s SoftBank Robotics. The robot has limited conversational ability and can interpret and respond to emotions. 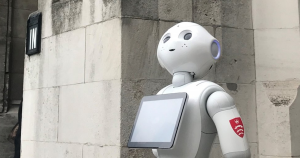 Brands that have dabbled with using Pepper to interact with customers include Pizza Hut and a Scottish grocery store, which eventually fired the robot. We’ll be watching to see if the bot can do any better in Parliament.